News, reviews, information and apps for Nokia and Symbian. The balance between an application simply being an on-device advert and being genuinely useful is often a hard one to strike, but AA Breakdown & Traffic has got it slap, bang on right. 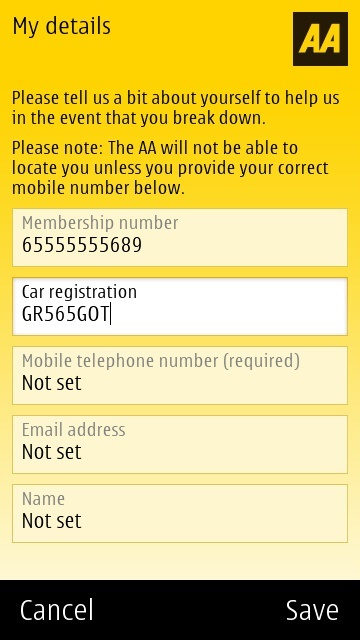 Holding your details, providing an obvious action to take in the event of a breakdown and advising on incidents are all part and parcel of this useful little applet... even if you're not actually an AA member. At least the folks at the AA were in a good position when they commissioned this application from developers Future Platforms. 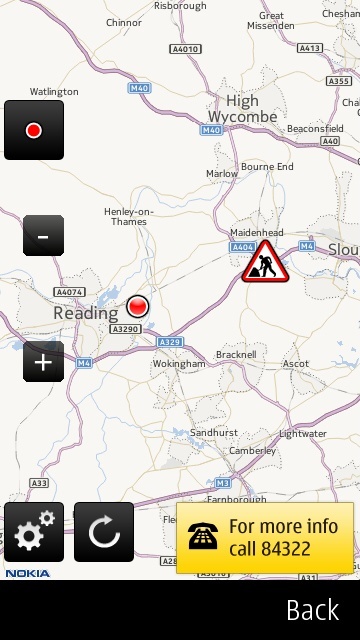 Most organisations are full of products but with little actual value to push to a smartphone app - the AA has a nationwide (for the UK), real time database of traffic incidents and this forms the core of 'AA Breakdown & Traffic'. So there's definitely value here other than the AA-specific membership and commercial adverts, which makes the application worth reviewing. 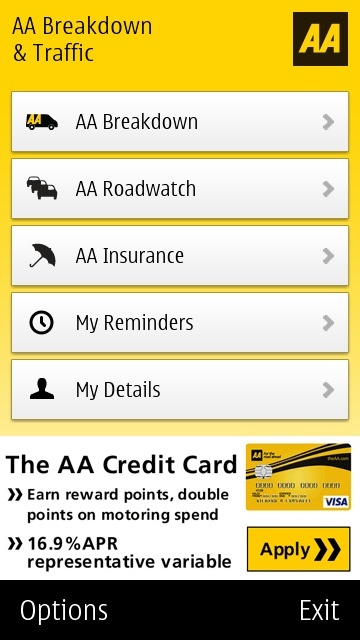 Although you don't have to be an AA member to use this application, it does help. 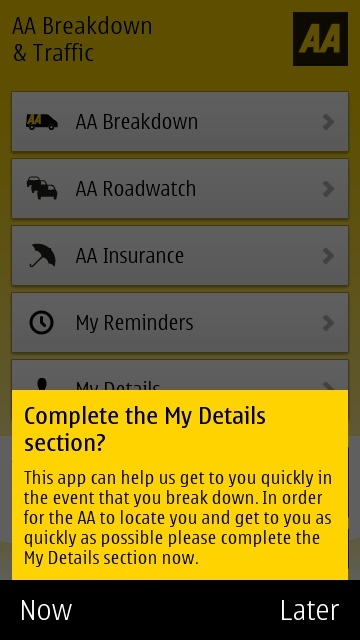 You're prompted to enter your salient details, shown above right, when you first start the app - these are stored and submitted to the AA's call centre when needed, before a breakdown call, though of course they're also here for you, as a handy reminder, should you use another service. AA Breakdown & Traffic is fully GPS-aware, happily, I've deliberately zoomed out for the screens above, for privacy reasons, but the original 'You are here' map had me down to a few metres. So you can just tap on the 'Call now' button and your position and details will be submitted electronically, followed by the main voice call. In theory, the operator at the other end won't be able say the typical 'Can I have all your details, please? ', followed by 'Where are you?' 'Oh, I'm halfway down the A3-something-or-other, by some houses', and so on.... Having all the relevant data managed by, and transmitted from, the application should be a big time saver all round. 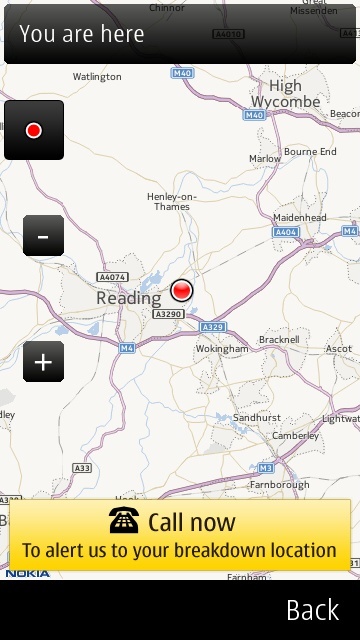 The Roadwatch system hooks you into the real time database that the AA maintains, as shown above, centre. At any given time there are up to a hundred things to note nationwide. 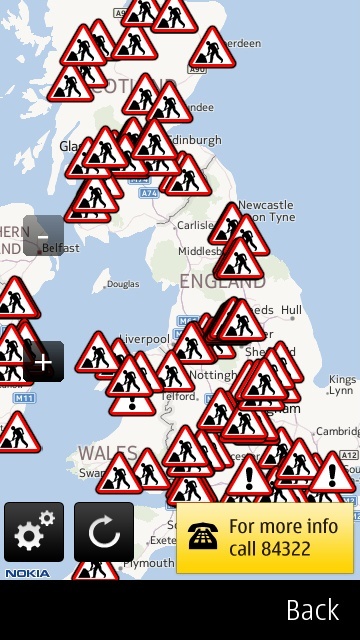 Once the app has your location, it'll start with items around you, on the map - tapping any roadworks ('man opening umbrella'!!) 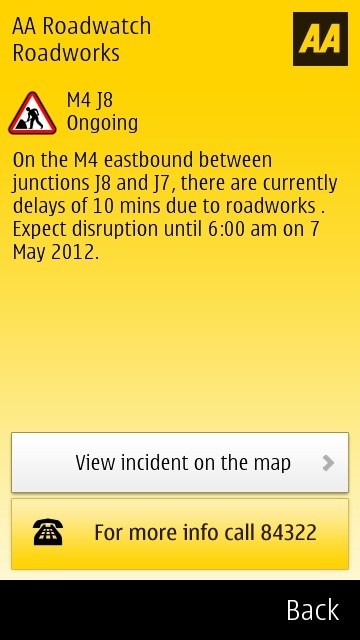 or incident ('!') icon brings up first a pop-up and then a full-screen details pane, shown below, left. Very handy, even if you don't belong to any national road rescue network. The aforementioned commercial adverts are everywhere, of course, though understandable in this sort of name-brand free application. 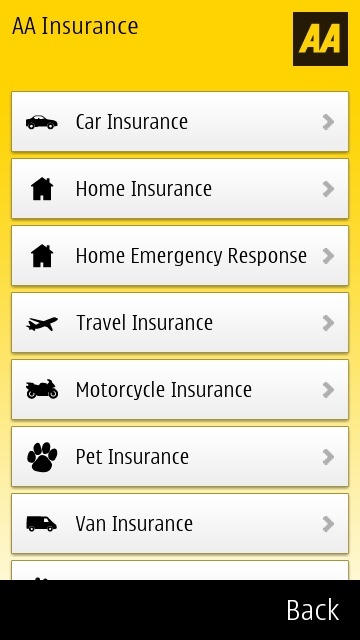 There are the front page ads, plus the 'Insurance' section, essentially just deep links to the appropriate mobile-friendly web page for each type of insurance that the AA organisation offers. If only a small proportion of users had a policy up for renewal then the links and numbers here might be a valid starting point, though I'd usually recommend one of the many insurance comparison sites first. My reminders is a nice idea, wherein you can enter dates, telephone and policy numbers for each of 'Breakdown', 'Insurance', 'Vehicle tax', 'Car service' and 'MOT'. 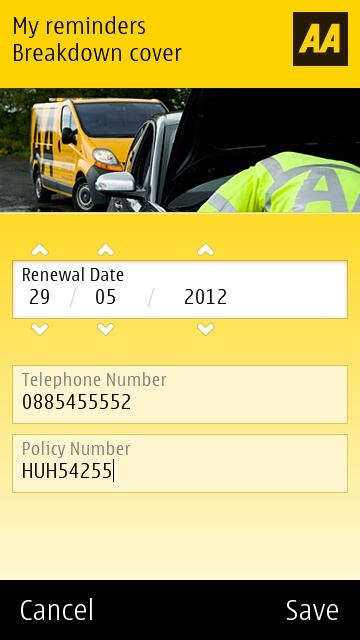 There's no direct access through to Calendar on the phone though, so the AA application can only remind you of an upcoming annual renewal if you have it running in the first place, perhaps to check on road conditions? Considering that AA Breakdown & Traffic is free, it's a qualified recommendation for all UK car drivers, and a hearty recommendation for those who are also members of the AA. It's well implemented in Qt, runs at an acceptable speed, is fully GPS, maps and communications aware and is attractively presented on-screen. Go grab it now. All About Symbian provides an independent source of news, reviews, apps and more to the Symbian and Nokia ecosystem. Get in touch: Email, Twitter or Facebook. This website is not in any way endorsed by Nokia. Symbian and all Symbian marks and logos are trademarks of Nokia.